Cincinnati, Ohio — Collective impact partnerships, place-based initiatives, community school efforts and many other organizations rely on access to student-level data to personalize ways to help students succeed. But data sharing comes with the crucial responsibility to use it effectively and responsibly, and to protect student privacy. Today, StriveTogether released two new publications designed to help communities responsibly use student data and effectively partner with schools on data-driven ways to improve education outcomes. 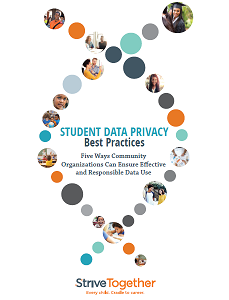 The first publication, “Student Data Privacy Best Practices: Five Ways Community Organizations Can Ensure Effective and Responsible Data Use,” includes recommendations for community organizations on how to effectively use data to impact student achievement, while protecting student privacy. An output of a StriveTogether-led taskforce of local community practitioners and national data use experts, the paper provides guidance to help organizations navigate privacy regulations, data security strategies and partner engagement. 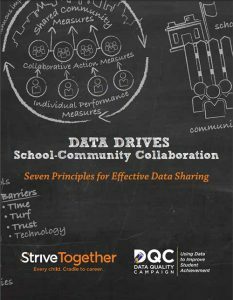 StriveTogether also partnered with the Data Quality Campaign, a national advocacy organization focused on empowering everyone who has a stake in education with data to improve student achievement, to publish a second student data resource for communities, “Data Drives School-Community Collaboration: 7 Principles for Effective Data Sharing.” This resource is designed to help organizations implement complex data partnerships, with seven key lessons about how to begin and grow a data-driven initiative with schools and other community partners. StriveTogether and members of the student data privacy taskforce, including the Data Quality Campaign, will host a webinar on Feb. 18 at 1 p.m. EST focused on responsible data use. The webinar is free and open to the public. To register, please visit www.strivetogether.org. The Data Quality Campaign (DQC) is a nonprofit, nonpartisan, national advocacy organization committed to realizing an education system in which all stakeholders—from parents to policymakers—are empowered with high-quality data from the early childhood, K–12, postsecondary, and workforce systems. To achieve this vision, DQC supports policymakers and other key leaders to promote effective data use to ensure students graduate from high school prepared for success in college and the workplace.